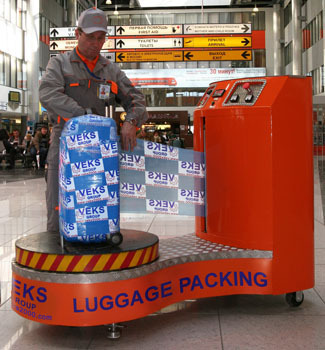 VEKS UPACKMACH Co Ltd was established in 1996 to organize luggage and small cargos packing service using plastic stretch film in airports, train stations, and freight terminals. 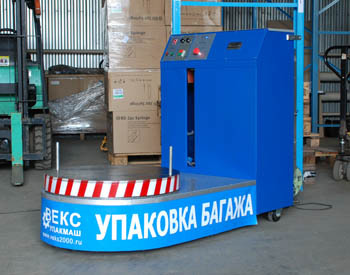 Today VEKS UPAKMACH - a company dedicated to developing, manufacturing and selling various types of packaging equipment for airports, freight terminals, mini-manufactures and warehouse storages. The main characteristics of our machinery are compactness, high reliability, usability and low power consumption. The equipment specifically designed for maintenance and operations personnel with different levels of skill in the packaging industry. At present, we have developed a new luggage packing machine construction, UPM-20, with special attention paid to its ergonomics and design. As compared to the previous model series UPM-3M and UPM-3S, the essential changes were made in the machine construction, which allowed the improvement of its characteristics and the decrease of its dimensions and weight. We have also developed the electronic units to display the current revolution speed on LCDs, and for the control total number of revolutions per shift and of total machine running time. Voltage and current meters were mounted on the front control panel. This new packing machine meets all the up-to-date demands for such machinery. The main principle underlying the packing machine work is the usage of special stretch film which is preliminarily stretched up to 250% of its original length (Power Stretch™). The machine is compact (it occupies less than 2 sq. m) and mobile. The batteries of extended capacity allow to run the machine autonomously for 6-8 hours. 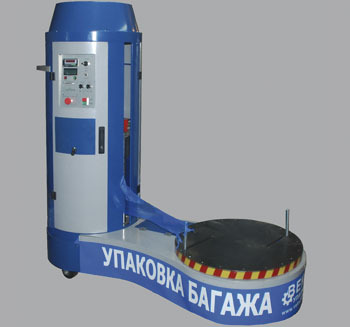 Due to its comparatively low weight and small dimensions, the machine can be easily moved to different parts of terminal for more efficient usage. During packing, there are no adhesive materials used (except for adhesive Scotch tape to fix the film tips), nor any temperature applied. Therefore, the packing process is ecologically safe. We also produce a special model series of packing machines UPM-10 for freight terminals, mini-manufactures, and store holders. Optionally, all the packing machines can be equipped with built-in two- or three-point electronic weighing-machine for weighting cargos, and also with power supply from 220V AC network. We provide a 2-year warranty for all our packing machines.